Just a few more steps! Inside the stadium approaching the finish. For years I’ve said I had a Personal Record (PR) for everything except hammer throw or an ultramarathon. You name it, I’ve done it. Marathon. Pole Vault. Hurdles (high & low). Javelin. Steeplechase. Mile (flat & beer). In 2010, I first ran the 33-mile Saltwater 5000, a noncompetitive ultradistance event, and in 2011 I suffered through 32-miles in a 6-hour race on zero training. Technically ultras, yes, but not the kind I wanted to hang my hat on. So I hatched a plan to run Comrades in South Africa, the one ultra that had a history and tradition that rivals the Boston Marathon. Being part of something that special was a real draw for me. The race is called the Comrades Marathon but it’s 56 miles long. I guess back in 1921 the marathon distance hadn’t been standardized and the name stuck. Comrades alternates directions each year between the inland city of Pietermaritzburg and the coastal city of Durban. Imagine if they did that in Boston, and finished in Hopkinton every other year? When an immigration agent in Johannesburg’s airport asked me “What is the purpose of your trip to South Africa?” I proudly answered “I’ve come to run the Comrades Marathon” his eyes got big and a smile swept across his face. He shook his head and said “Man that is one long race. Good luck to you” as he handed me back my passport and welcomed me to his country. The 2014 Comrades finished in Durban, a so-called Down run, which appealed to me. “They” said the Down run was hard, painful and contained more uphills than you think. I didn’t believe them. After all, I’ve run the Catalina Marathon 14 times. Well, “they” were right. This course is HARD! Did I underestimate its difficulty? Perhaps. Toiling on the many uphills. Comrades awards medals based on finish time. This is cool, and gives you something to shoot for. 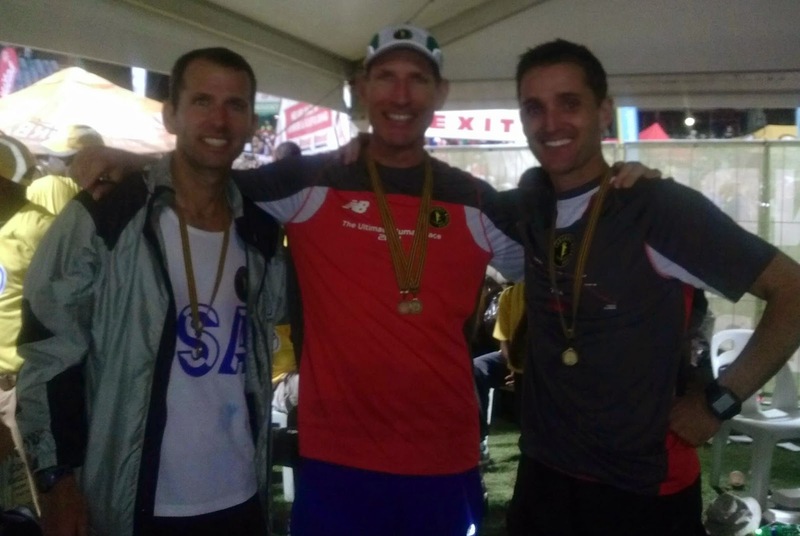 Interspersed with the gold, silver and bronze medals are three named for Comrades legends. I thought I had a good shot at the 7:30 – 9:00 Bill Rowan medal. I knew I was in trouble by the 23rd mile. Which was a really miserable feeling knowing I was already out of gas and I still had a whopping 33 miles to go. Did I mention this was miserable? My splits may suggest otherwise, but I don’t believe I started too fast. I was averaging around 8:30 pace for those first 23 miles. That’s a minute-per-mile slower than I ran in the Akron Marathon last fall. In theory I should have been just cruising. Nothing was wrong – no blisters, GI issues or anything. Just. Tired. Maybe arriving Friday didn’t allow me enough time to adjust to the time difference. I know barely sleeping on Saturday night couldn’t have helped. Most of the last 30 miles were really painful. I did have a decent 10-mile stretch from 33 to 43, and began thinking maybe I could salvage a sub-9, but that went away when the long downhill ended. I was back to the walk-shuffle-walk method of ambulation. When I realized I wouldn’t make the 9-hour cutoff, I felt certain I would finish in bronze medal time (9-11 hours), and set about to getting in under 10 hours. I mercifully finished in 9:37:26, 3,202 of 14,620 starters. Comrades has a strict 12-hour cutoff time. If you are not finished, you are out. No exceptions. Which means the finish becomes extremely emotional as the clock counts down and people sprint, limp, are carried into the stadium and across the line. People are stopped yards short every year and this was no exception. Comrades uses chip timing (with 15,000 starters they obviously need them for automating results) – but they rely strictly on GUN TIME for finishing positions and medals. Not such a big deal for me, as my qualifying time landed me in in Corral B. It took me 34 seconds to cross the starting line. Not so for the folks in Corral H, who started in a 10+ minute hole. Fellow SCRR member Ted Williamson improved by 48 minutes on his 2013 time to finish in 9:00:36, agonizingly close to scoring the coveted Bill Rowan medal. It didn’t matter that his chip time was 8:56:46. He earned a bronze like me. Ted completely rocked this race. In a regular marathon, there seems to always be some dummy who shouts “only 24 miles to go” at the 2-mile mark. Well, Comrades sticks this in your face with ‘countdown’ markers. In kilometers. So after about 2 miles you pass the “86 km to go” sign. And so on. It can mess with your head. Comrades also has you wear bib numbers on your front AND back. And the bibs contain a wealth of information. Your name, starting corral, age group, how many Comrades you’ve finished – and background color denotes various other things (like blue for international). It was really very cool how veterans would pat me on the shoulder asking how I’m enjoying my first Comrades. I mostly had to struggle to respond politely. The bibs also took my mind off how bad I was hurting. It was fun to be reading people’s names, looking at their age group, starting corral and the like as we passed each other. Let me just say that a lot of South African names are unpronounceable. Someone from Comrades USA made up cool ‘Team USA’ shirts. Upon realizing there were only around 200 Americans in the field the idea began to appeal to me so I went ahead and got one. I’m glad I did. There is something special to ‘representing’ the USA in an international race. Crowd support was incredible. People the entire race were barbecuing, drinking beer and having a huge 89-km block party. The cheering was crazy. “Go Michael” and “U-S-A” were ringing in my ears and there were always little kids to high-5. Home stretch. The closer we got to Durban, the louder the crowd became. The course management, traffic, aid stations, first aid, finish line, results were great. This is truly a world-class event. I'd like to blame the second half of the race on the weather - but I can't. It was cold at the start - I wore a disposable jacket for the first 12 miles. Now some kid is running around South Africa with a sweaty OC Marathon jacket. As the day progressed it got warmer, but a thick overcast kept the direct sunlight at bay. For me at least, I don't feel like it was a factor. Kona Ironman legend Scott Molina finished less than two minutes ahead of me. Our split times suggest we must have passed each other several times on the course. I wish I’d recognized him. It might have given me some inspiration to push harder (read: walk less) the last few miles. I’m proud to say all of my toenails are intact. Indeed, my feet are really quite beautiful. This was the 89th Comrades. 29 years ago I also finished the 89th Boston Marathon. Oh, and the medals we all worked so hard for? They're tiny. Really tiny. No less meaningful, but quite contrary to all of the platter-sized medals presented at most races these days. But let me tell you there were a lot of very proud runners shuffling around Durban on Monday rocking their tiny hardware. It's true. Size doesn't matter! The people of Comrades are amazing. Everywhere we turned we met great people. From Australia. Europe. South Africa. Other Americans. Fast people (we hung out before and after the race with Kirsten Leemans, a bloke from Johannesburg who placed 59th in a stunning 6:20:02! ), mid-packers, people who just made the cutoff (one in 11:58:30) and many who didn’t make it through the final checkpoint and had to step off the course after 50+ miles. The “Spirit of Comrades” is a real thing. And it’s intoxicating. Too tired to celebrate? Not a chance! Comrades was Day 380 of my streak of running every day. Monday was Day 381 and I did 4 miles on the treadmill at the Hilton. I think that impressed some of the folks we were hanging out with. Even Kirsten the fast guy. I’ve never hurt so bad in any athletic endeavor. Ever. I was so miserable I swore I’d never do this again. But now after a few days I’m not so sure. Two race reports worth reading are Kelly Agnew’s from Utah, whom we met at the Hilton bar on Monday night, and Ellie Greenwood from Canada, who won the women’s race, defeating the identical Russian twins who have had a stranglehold on this race for the last decade (a la Venus & Serena in tennis). Since finishing, the frustration and pain I felt during the race has given way to a satisfaction that this is a performance I can be proud of. I certainly left myself room to improve, but I am indeed proud nonetheless. The people and history I encountered combined to make this a truly rich experience. I’m so very grateful for my family for supporting this crazy dream of mine. I know it’s a very selfish thing to undertake. And while I can now say I’ve finished the world’s oldest and largest ultramarathon, I still don’t see myself as an ‘ultra guy’. Rather, I’m a runner who likes all aspects of the sport. Except hammer throw I guess. I still don’t have a PR for that.